You deserve a bed with a distinctive appearance that allows you to lounge in comfort. Our Barnwood Bed in Reclaimed Barnwood is made from wood once used as a barn. We take this wood and repurpose it, giving it a second life in your bedroom. 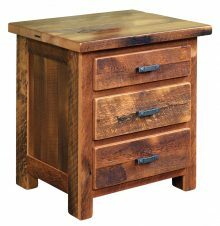 This provides an eco-friendly means of producing furniture, something that appeals to so many customers at a time when people want to preserve our environment. This wood displays character from its previous life, and it is unique to your home. Every piece of barnwood looks slightly different and has its own story to tell. 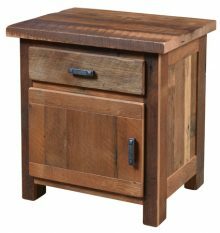 Barnwood produces sturdy, durable furniture you can rely on for years to come. Our exceptionally made beds provide a restful place for you to spend the night. You will enjoy knowing the wood that supports you served an entirely different purpose not too long ago. Choose either a queen- or king-sized bed for your bedroom. The Amish artisans who create our beds, dressers and other furniture learned their trade by watching their parents and grandparents build furniture. As children, these gifted craftsmen observed the techniques used by their elders and later put these into practice. They keep employing such methods because they work. Our furniture stands up to long-term use. In fact, the weathered look of the wood looks even better with time. We offer up to 33 percent off everyday prices, in addition to providing monthly specials you can find on our website. Contact us to learn more about the Barnwood Bed in Reclaimed Barnwood.